Just as a week is a long time in politics, an hour and a half on a Sunday is a long time in F1. And how the dark clouds parted therein for Lewis Hamilton at Silverstone. After a dominant win, allied to late tyre failures for Ferrari, it all looks good for him. He's but a point off the drivers' table top and suddenly it's conspicuous that Ferrari hasn't out-paced Mercedes since Monaco in May. 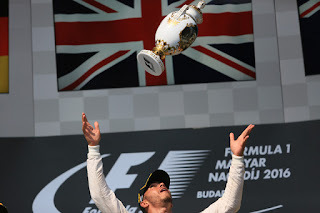 And even better for Lewis this round coming is at the Hungaroring. It's long been his happy hunting ground; he's won here five times and adores the go kart track challenges. The 23/17 available for him to win looks well worth your wager. It might get even better for Lewis as pole position will mean he equals Michael Schumacher's all-time record for F1 poles, and even at odds on - 11/13 - it may still be where the smart money is this time. You also can get 5/4 for a Lewis fastest lap - and he's got six fastest laps from 10 rounds this year, as well as three from the last four. And if you want to get more intricate with your assumption of a Lewis walkover, you can get 11/10 on the pole winning margin being more than two tenths of a second. The bookies however remain slow on the uptake of Valtteri Bottas's recent improved form. You can get a full 7/2 for him to take pole, and an even more generous 11/2 for him to win. There's likely no point in betting elsewhere for pole. Even Sebastian Vettel has admitted that Merc's qualifying recent improvement has left all others breathless. Forecasts suggest rain won't intervene. There are a few interesting looking medium-range shots to get on the podium. The twisty track may suit the Red Bull, and Daniel Ricciardo is another with a strong previous here - he's available at 2/1 to finish in the top three. Similar goes for Ferrari's Kimi Raikkonen and he can be backed at a full 3/1 to do the same. It's a round identified as a good opportunity for a better than usual result for those with a strong chassis and a less strong engine. This means McLaren and Toro Rosso, and Fernando Alonso and Carlos Sainz can each be got at 15/4 to finish in the top six. And if you fancy their respective team mates to finish in the points then Stoffel Vandoorne and Daniil Kvyat can be backed at 33/20 to do this. Plus McLaren is available at 7/2 and Toro Rosso at 13/4 for a double points finish. All odds quoted in this article were accurate on the Oddschecker website at 2130 GMT on Wednesday 26 July 2017.